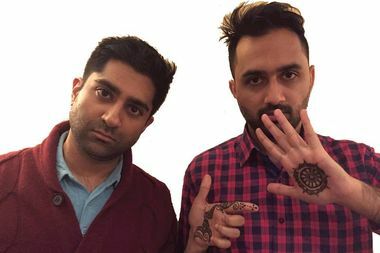 Comedian Saurin Choksi, left, and DJ Sareen Patel, right, co-host a monthly comedy show "Brown Privilege" at Friends and Lovers every third Tuesday of the month. CROWN HEIGHTS — When DJ Sareen Patel thought up the name for "Brown Privilege," the monthly comedy show he co-hosts in Crown Heights with comedian Saurin Choksi, “it was sort of a joke,” he said. “When I first said it, I just laughed and said, ‘Haha, there’s no such thing as that,’” he said. But after a while, the name became less funny and more of “a directive,” he said — to make sure the pair’s lineup is as diverse as possible. For Choksi, the show’s emcee and booker, that means finding funny people from very different backgrounds and, in particular, promoting women and people of color on stage. “If you book this show in 2016 and you book all, whatever, white guys or black males or all one thing, it just seems pretty tone deaf to me,” Choksi said. The result is a show (now in its ninth month with a show set for Tuesday, Sept. 20) where a varied, young slate of comedians perform in between bits by Choksi and Patel, a musician and DJ who musically riffs off his comic partner’s stand-up — the Paul Shaffer to Choksi’s Letterman, they say. The show is one of a half dozen comedy shows ongoing in Crown Heights now, part of a growing nightlife scene in the neighborhood that includes more bars, restaurants and event spaces. Choksi says among comics, Crown Heights has a “good community,” something he experienced firsthand when another area comedian, Khalid Rahmaan — current host of Comedy Electric (see below) and former host of the “It’s Soo Up & Coming” show at the now-defunct 739 Bar — reached out to him to perform a set as soon as he moved to New York two years ago. “The scene in Brooklyn is very supportive,” he said. When: Monthly every first Friday at 8 p.m.
Where: Franklin Electric co-working space, 650 Franklin Ave. The fifth show in this monthly series will take place on Oct. 7, hosted by Crown Heights local Khalid Rahmaan formerly of the popular “It’s Sooo Up & Coming” comedy night at 739 Bar, which closed in July. Admission to Comedy Electric is free — and so are drinks, provided by rotating sponsors. Tickets have sold out for the last four shows, Rahmaan said, so get yours early here. When: Monthly every third Friday at 8 p.m.
Where: Shoestring Press, 663 Classon Ave. This free monthly show has been running for almost three years at this Classon Avenue print shop, hosted by the improv troupe Swartzlander and featuring a mix of improv, stand-up, character acting and, sometimes, live music. Co-host Kyle Levenick aims to bring in local talent “whenever possible,” he said. After the show, performers and audience members usually go around the corner to hang out at the Berg’n beer hall. When: Twice monthly (on second and fourth Saturdays) at 8 p.m.
Where: Bluebird Cafe, 504 Flatbush Ave.
Prospect-Lefferts Gardens local comedians Charlie Kasov and Tyler Fischer have been co-hosting this bi-weekly comedy show in their neighborhood for about 18 months in an effort to bring a little bit of nightlife to the area, Kasov said. The pair line up four or five new stand-up acts every other week; tickets are $5 at the door. When: Monthly every third Tuesday at 8 p.m.
Where: Friends and Lovers, 641 Classon Ave.
Stand-up Saurin Choksi hosts with DJ Sareen Patel for this monthly, free show at Friends and Lovers that showcases a diverse lineup of comedians. The pair’s ninth show on Tuesday, Sept. 20 will feature six acts with headline Roy Wood Jr. of The Daily Show. When: Semi-regular; next show Sept. 29 at 8 p.m.
Where: Dean Street Cafe, 755 Dean St. In neighboring Prospect Heights, comedian Taylor Connelly hosts this semi-regular comedy night at the local eatery Dean Street with a powerful lineup of stand-ups. The next show, on Sept. 29, features Josh Gondleman, an Emmy-winning writer on HBO’s "Last Week Tonight." Tickets are $8 per person. When: Monthly every fourth Monday at 9 p.m.
Where: Two Saints, 753 Nostrand Ave.
Catch comedy on Nostrand Avenue with this new monthly show hosted by comedian Dan Fitzpatrick at the Two Saints bar. The no-cover show will take place next on Monday, Sept. 26 for a special political edition of the show where four comedians will riff on the televised presidential debate, set to air that night.